"Not your traditional apple pie, this filling is caramelized apples held together with a very glossy, just-thick-enough apple syrup." Unroll pie crusts, press one into a 9-inch pie dish, and place the apples into the crust. Unroll the second crust on a work surface, and cut into about 8 1-inch wide strips. 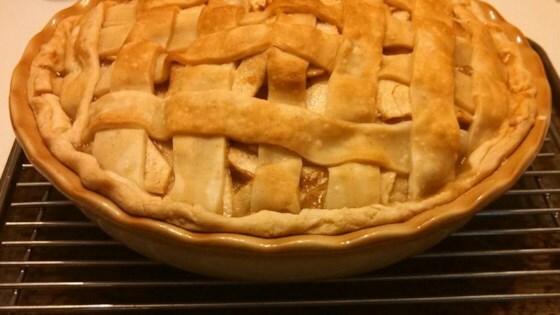 Criss-cross the strips over the apples, or weave into a lattice crust. Crimp the bottom crust over the lattice strips with your fingers. Spoon caramel sauce over pie, covering lattice portion of top crust; let remaining sauce drizzle through the crust. Bake in preheated oven for 15 minutes. Reduce heat to 350 degrees F (175 degrees C), and bake until the crust is golden brown, the caramel on the top crust is set, and the apple filling is bubbling, 35 to 40 more minutes. Allow to cool completely before slicing. Excellent recipe. I added lemon and orange essence, due to lack of lemons. I recommend the recipe.